Sometimes I am accused of not being critical enough of Scotland performances in these columns, preferring to talk about positive aspects of their play rather than bemoaning errors that have often led to losses. I try to look at reasons for failures or explanations why something might have happened, but I love talking up the positives, be it individual or collective. Why not celebrate the consistency of Greig Laidlaw's goal-kicking, the world-class overall performance of wing Tommy Seymour, the vision of the chip-kick by Finn Russell in the lead-up to Seymour's score, or Duncan Taylor's brilliant line and finish for his try? These are examples of world-class skills or execution and show that Scotland have the capability to compete and win consistently in the Six Nations. But that word 'consistently' is absolutely key because Scotland unfortunately haven't consistently performed the basics well enough to merit the wins week in, week out. This told in the last 15 minutes because Wales were able to maintain, and in some areas increase, their intensity where Scotland struggled to do so, with the use of the bench perhaps not having this desired effect. The George North try was soft and it would be easy to say this was just a schoolboy error and something that should have been covered on the training pitch, but I think it runs deeper than this. Wales have competed with the top teams in the world for the past 10 years, taking New Zealand, Australia and South Africa the distance on many occasions and regularly beating France, England and Ireland. The over tracking in defence by Laidlaw, John Hardie, Dave Denton and Blair Cowan was the end product of 60 minutes of a level of mental and physical intensity to which this Scotland side have not been accustomed. Wales, on the other hand, appear to thrive on the big moments. But it didn't happen overnight for them either. Easy to explain but not so easy to fix! Many Scotland supporters will be frustrated that the results aren't coming, especially with so much promise being shown. You will be fed up with me saying that time is required, but you don't suddenly go from regularly being fifth or sixth in the championship to beating the top sides away from home. First, there comes the belief that you can get to the last 20 minutes of the game and be in with a shout of winning, becoming accustomed to making the right decisions under the greatest of pressure. Then you take the huge step of winning, probably home games first, and then taking scalps in away games. You can say 'but for the past five years we've been learning'. But not with this group of players - they need their time too. And how do you get a win over the line? Sometimes it's as simple as a little bit of luck, which is always nice, but consistency of performance will allow Scotland to keep knocking at the door. Mr Clancy, the referee, might have been a touch more helpful too. His rulings on the Scottish mauls were baffling, twice allowing Alun Wyn Jones to collapse it - once after landing on top of the maul and allowing the turnover. 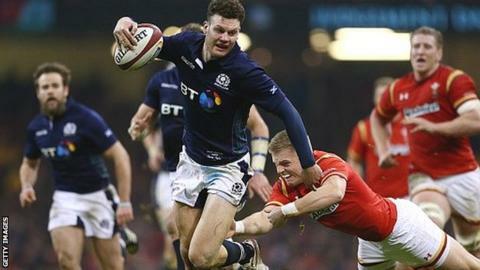 Also, at a crucial line-out, he penalised Richie Gray for 'closing the gap' after winning the opposition ball. It's an offence very rarely penalised despite happening often - in the same category as squint scrum feeds. If a technicality like that is being penalised then it might have paid to have had another look at the Gareth Davies try. Davies clearly advanced forward from his position in front of Dan Biggar, the kicker, which put him in an improved position to regather the ball and finish superbly. That's a penalty offence. My point isn't that Scotland were hard done by, but more that, to get over the nine-game Six Nations losing streak, it would be nice to get a little helping hand - be it from lady luck or a helpful refereeing decision. The players can't afford to think like that though. They need to keep improving, keep working, never feel sorry for themselves and learn from their experiences because you only get a certain amount of chances before someone else is given the opportunity.